nutrient-dense, dark-green blend of organic wheatgrass and organic alfalfa combined with another nutrient-dense superfood. We all know the benefits of eating greens, but it is sometimes a challenge to get enough into our diet. There is an easy way to instantly get this vegetable nutrition with supplemental powders. Alfalfa has been eaten for centuries by people seeking a rich source of essential minerals and vitamins. PINES is the FIRST alfalfa leaf on the planet to be VERIFIED by the Non-GMO Project. PINES Alfalfa is the most nutritious alfalfa available, having been grown and packaged with the same exquisite care as PINES’ other healthy products. Just one look at its dark green color sets it apart from any other alfalfa. 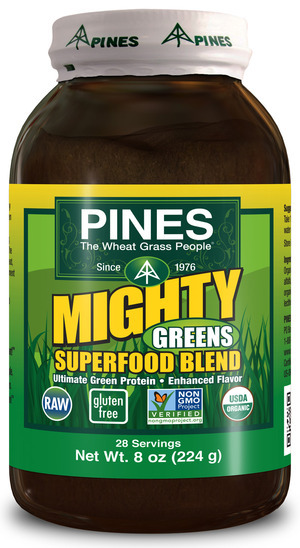 Mighty Greens is a great-tasting, dark-green food that you can mix with water or juice or add to just about any recipe. What exactly IS Mighty Greens? It’s a simple and effective nutrient-dense, dark-green blend of organic wheatgrass and organic alfalfa combined with another nutrient-dense superfood. Kids love the taste of Mighty Greens – and adults do, too. Energize naturally with this delicious and nutritious whole food. These products are also available in pill form, but I prefer powders for putting in smoothies, juice, or water. These products are made in the USA and come in oxygen-free glass bottles which is much better for the environment and the product. Oxygen is essential for life, but when oxygen is in contact with wheatgrass powder or other highly-pigmented superfoods for several months before being consumed, it allows nutrients in these foods to slowly devitalize through the process known as oxidation. Thus, even though you must have oxygen to live, oxygen in bottles containing wheatgrass and other highly pigmented superfoods is not a good idea because between the time the product is packaged and the time you open the bottle, the oxygen in the bottle has caused the contents of the bottle to lose nutrition. By volume, dry air contains 78.09% nitrogen, 20.95% oxygen, 0.93% argon: thus, when a highly pigmented superfood like wheatgrass is packaged in bottles containing air, it slowly oxidizes and loses nutrition while in transit, while it sits in a warehouse and/or while it sits on a store’s shelf. Over the course of months, oxidation will significantly devitalize and deteriorate many of the most valuable nutrients in the food. Highly pigmented superfoods packaged in flimsy plastic tubs or paper/plastic/foil packets are particularly subject to oxidation not only because they are packaged with air, but also because these thin walled containers do not protect the product from outside air and humidity, which continually seeps in through the microscopic porosity of low-grade packaging materials. Further, in the case of plastic, the food can become contaminated from the petrochemicals that are used to make the plastic. Recent studies show that nearly all plastic, including non-BPA plastic, contain chemicals that can mimic estrogen and play havoc with endocrine systems. I really like Pines International products, and I completely trust the company. I also really like the flavor of these powders and the way they make me feel energized and full of vitality. I also highly recommend Alfalfa if you are pregnant. I supplemented during my last trimester at the advice of my midwives. The chlorophyll is important for brain development. « Save that old outdoor furniture!